Virtual Reality is HUGE. This is not just a gimmick. It’s really, truly powerful and it takes you into the realm of imaginary worlds in a highly interactive way. You can walk, spin, look in all directions, reach high, bend low, etc… The headset ceases to be noticeable. You really do feel like you are there. The ability to learn and train could be incredibly hands-on and demonstrative in a whole new way. It is hard to describe the powerful impact this had on me when I put on the Vive for the first time. I felt the world advance in front of my eyes, and in an instant I knew this was much more profound than I initially realized. 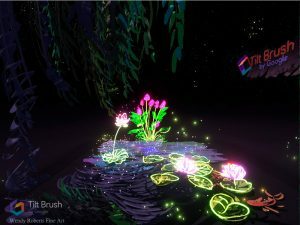 Tilt Brush is a virtual reality 3D paint program, and it is AMAZING!!! 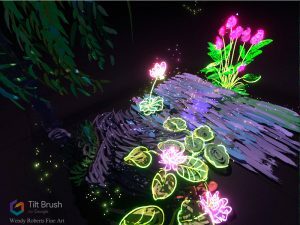 I first saw Tilt Brush on a video shared on Facebook, and I knew I was probably going to love it if I even got the chance to play with it, but I had no idea that I would get the chance to paint in virtual reality this soon! Cosmic Lotus Pond: tree on the left, ginger on the right; the water sparkles thanks to the “star” paint. 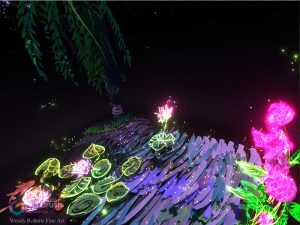 Tilt Brush allows you to paint with oil paint, ink, magical sparkles, and light, but it resembles sculpting too since it is a 3D process. 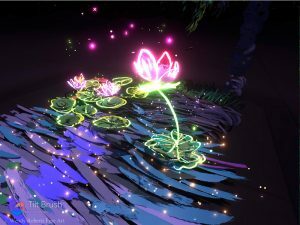 I tried several of the Tilt Brush paint tools to create “Cosmic Lotus Pond” which is my first very quick Vive art sketch. I wanted it to feel like a mix between stepping into an Impressionist oil painting and an over the top dream with plenty of animation, glow and sparkle. Because it is almost impossible to reference any photos, and because of the way the tool performs, it’s best to utilize its strengths and do something directly from imagination. I have painted ponds a lot, and I’m familiar with my pink ginger plants and their leaf structure, so I started with things I know well, and used their forms for inspiration. I learned a lot about how the Tilt Brush Works during my first session. It’s very intuitive! I never had to read any instructions. If you have ever used a graphics program like Photoshop or Illustrator, or any number of other programs for digital illustration, this is going to be really easy for you to use. The best part about Vive Art is that you can walk around inside the painting. The tree in “Cosmic Lotus Pond” is 6 feet tall, the ginger is about 3 feet tall. The pond is a couple of inches above the ground and roughly 9 feet square. There is an infinite sky environment with pre-programmed nebulae and stars that stretch to an infinite horizon. You can walk past the tree, and bend down to see the whole piece from a totally different angle. All the magic sparkles are animated to twinkle, which lends the water a feeling of increased movement. It is really otherworldly. This is a fantastic, playful outlet to flex your creativity. The art is very interactive and packs a lot of impact when you wear the Vive headset. 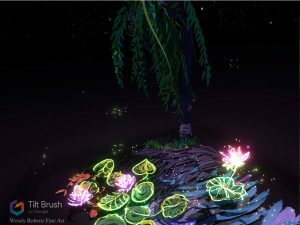 It is a lot harder to achieve any level of realism with the Tilt Brush than traditional painting or 3D animation programs, so it seems best suited not for realistic environments, but rather, for a surreal loose approach that takes advantage of the fact that you can paint with actual light. I plan to play with it a lot more in the future and pull the viewer into my imaginary dreamworlds in this new and powerful way. Cosmic Lotus Pond: bending down to look at the lotus.